I weigh myself every morning. I’m not on a diet, but it’s a number I like to keep track of. I don’t keep track of it very well on my own, though; I can give you an approximation within three pounds, but I don’t often remember exactly what the scale read this morning, or if it’s higher or lower than yesterday’s number. Enter A+ Weight Tracker, an app from Vita Stone Ltd. that does exactly what its title suggests. 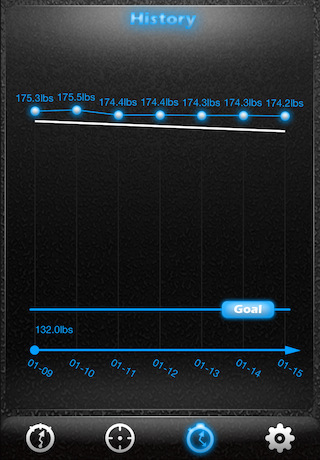 You enter your weight each day, and the app charts your progress towards your weight loss/gain goal. The app does require a target weight and date, but if you’re happy with your current weight you can just enter that. 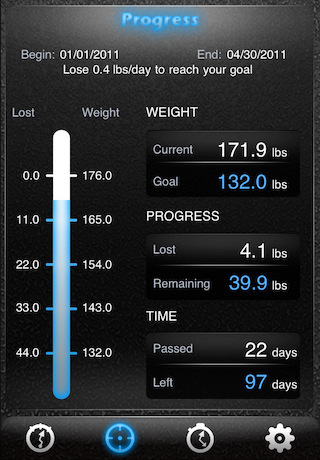 The app will also calculate your BMI, days elapsed and days left to meet your goal, and ideal daily weight loss. If you want, you can add daily notes. The interface is intuitive, and I love its glowing, Tron-esque blue-on-black design – although my inner typography geek would prefer a different font for the page titles. My favorite thing about A+ Weight Tracker is not a feature it includes, but one it leaves out: unsolicited advice. Many weight-tracking apps strive to be your diet buddy, offering robotic encouragement and “helpful hints” you already know, like drinking water instead of soda. A+ Weight Tracker helps you visualize your progress and target, but doesn’t coach or cheerlead. However, the app feels a little spare, especially for its $2.99 price tag. There are a few features I’d like to see in a future update: the option to see my average and target weight by week rather than by day, the ability to view my progress chart by more than one week at a time, and a way to view all notes at once. I think the ability to enter and chart daily calorie intake would be useful, too. With a little added functionality and a couple minor tweaks to the interface, this app could be awesome. If A+ Weight Tracker were a little more fleshed out, it would earn the A+ in its name. As it is, I’d give it a B. It works for my purposes, so I’ll continue to use it daily, and I’ll keep an eye out in case Vita Stone releases any updates. AppSafari review of A+ Weight Tracker was written by Katherine Thorne on February 22nd, 2011 and categorized under App Store, Health, Notes. Page viewed 4604 times, 2 so far today. Need help on using these apps? Please read the Help Page.